I bought these Clover Jumbo Wonder Clips some time ago because I already had these little red ones and I thought bigger ones would be nice to have, though I wasn’t really sure what I was going to use them for. As it turns out, they are really handy for embroidery. When I have bigger pieces that I am embroidering on, I usually end up holding parts out of the way of the embroidery hoop. My daughter wanted her name on her basketball bag. The side of the bag bounced about, even though I had rolled and scrunched it up. The clips were wide enough to hold onto the scrunched up bag and made it so much easier to control. These came in the mail the other day, but I didn’t realize they were there right away because they were an unexpected surprise hidden in the package. And what a sweet surprise! They came from this etsy shop – Maggie’s Sweet Nothings. She has a whole section of pins with these polymer clay toppers that she makes for them. Check out the tiny details on these! I wish I could get a better close up on that flower, the petals are more defined than they look in the picture. It is just so tiny my camera doesn’t want to catch it! I love the hardware store. I might even love it as much as I love the fabric store. Yup. It’s a little razor blade from my workshop toolbox. I suppose it’s more of an un-sewing tool. It is wonderful for slicing out seams. In this case, it’s the seam on the waistband on my husband’s favorite sweatpants. The elastic made that crinkly sound when stretched, where you know it’s no longer going to bounce back. I really dislike mending and normally I would not take apart three waist seams to replace a drawstring elastic, but when your spouse is starting to workout you want to encourage him, so his favorite sweats must be saved! 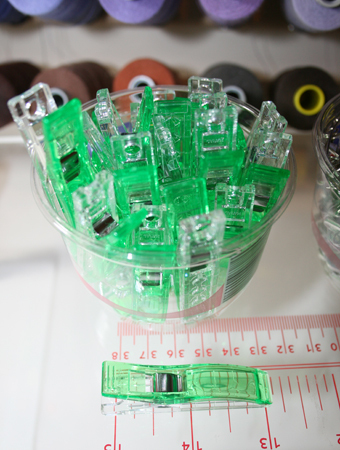 What’s your favorite non-sewing sewing tool? A scanner to match fabric to thread? Wouldn’t it be great if you could take your fabric swatch to the store and, instead of holding it up to various spools of thread, you could just scan it and the machine would tell you the perfect match? I came across a press release today that makes me think this might not be too far off! The new Coats Color CAPSURE device is part of the Coats Color Express system. Industrial manufacturers can scan any material and get a precisely matched color of thread. Coats has 14,000 shades available to commercial customers. Wouldn’t it be great to have that same matching available in a retail store? Maybe Coats could modify it to match to the closest retail color offered. Then they could collect data on the colors that didn’t have exact matches to help them better know what colors should be offered in the future. It would also reduce the chances that your preschool assistant has time to pull a dozen spools off the display while you get what you need. Sounds like a win-win! How long has the needle been in your sewing machine? Did it come with the machine? Do you just keep using the same one until you run over a pin and it breaks? Or until things just keep going horribly wrong with your stitches and you start swapping out everything – needles, thread, bobbin? 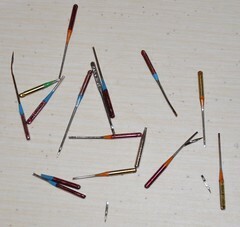 Image: Broken Needles by amboo who? Your sewing projects will look better and go more smoothly if you use a new needle after 8-12 hours of sewing or every 2-3 projects. 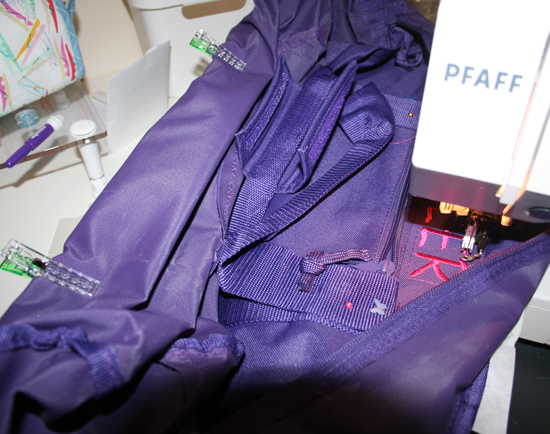 And if you hit a pin, button, or other object while sewing, replace that needle right away, even if it looks okay. 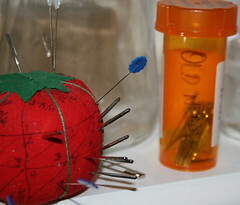 A damaged or worn out needle leads to damaged fabric and a ruined project. You’re putting a lot of time into your sewing, don’t let the needle foil your efforts. Why don’t we change needles when we should? Reason #1: Keeping track of how long a needle has been used is not easy! Not pretty, but functional. The tomato is split so each column has five sections. Each time I finish a project or use the needle for about two hours, I put the needle in the next spot. 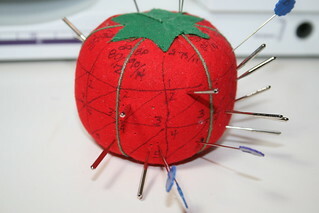 The pins are marked and hold the spot for the needles currently in use. If I finish the project and need the needle for something else in the same machine, I’ll just move the pin to the next spot. The blue pins in the #5 spot for the 90/14 ball point needles are holding the space for the needles currently in my serger. When I’m done with them, I’ll retire that set of needles since this is their fifth use. When they’re done, I put them in an old prescription pill container. There are a couple things that make this setup work well, besides the ability to keep track of length of use. First, I know which needles are sharps and which are ball points. Second, I don’t have to try to read the itty bitty writing on them to see what size they are. But, it’s not pretty. Reason #2: Needles are expensive! 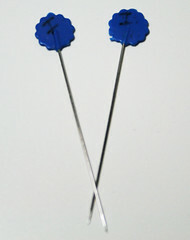 My favorite place to buy needles is CTSUSA.com because their prices are great and they offer free shipping on needles. My sewing machine, a Bernina uses 15×1/HAx1 household machine needles. CTSUSA.com currently has these for $11.95 for 100 needles in some of the most common sizes. Yep, less than twelve cents a needle. The cost of needles is no longer an excuse not to change them. But 100 needles? Where do you put them? I happened upon this cute little storage box in the craft section. It was probably intended for beads or something similar, but it’s the perfect size for needle packs. Needle packs are small, if I tossed them in a drawer, they would be all over and I’d be opening a new pack all the time. This keeps them organized. Do you have a great way to keep track of your needle use? I’d love to see it, especially if it looks nicer than my sharpie tomato!